OTSEGO COUNTY — The Headwaters Chapter of Trout Unlimited (TU) is looking for three or four teenagers interested in attending a four-day trout fishing camp on the AuSable River. The July 7–11 retreat will take place at the Ralph A. MacMullan Conference Center on Higgins Lake in Roscommon. Participants will receive instruction on how to fly fish and spinner fish for trout, and will enjoy fishing outings on all three branches of the AuSable River, a canoeing trip on the Manistee River and beach time on Higgins Lake. They will have the chance to catch brook, rainbow and brown trout. To apply for the camp through the local chapter of TU, any area child between ages 12 and 16 can write a one-page essay on the subject, “Why I want to go to youth trout camp,” and submit it to Headwaters Chapter president John Walters by May 1. Typed essays should be in a Microsoft Word document and e-mailed to headwaterstu@yahoo.com or printed and mailed to P.O. Box 1873, Gaylord MI 49734. Those who are chosen by TU will have their trip provided at no cost (regularly $350) and will be given a fly rod and reel to use on the trip and keep. In addition to learning how to fish, participants will learn about the importance of water quality for trout habitat; search for and identify aquatic invertebrates trout feed on; and get an introduction to fish and habitat conservation. Participants stay in dorm-style housing and have all their meals provided. The camp is hosted by the Kalamazoo Valley Chapter of TU and is made possible by volunteers and members of local and national TU chapters. Also helping out are staff of the Department of Natural Resources Fisheries Division, staff of the Ralph A. MacMullan Center, AmeriCorps, volunteers with the Department of Environmental Quality, Huron Pines, fishing guides and others. 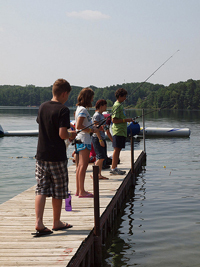 For more information about the trout camp, visit www.kvctu.org and click “Michigan Youth Trout Camp” in the upper right corner of the page. Now that you’ve finished this lesson, you’re better prepared to make decisions about all the information that comes your way on a daily basis. Using the information in the lesson will make you a better reader and will help you make better choices about the information you read.